The sentimental (appealing to the emotions) poems of the American writer Henry Wadsworth Longfellow made him an extremely popular author at home and in other countries in the nineteenth century. 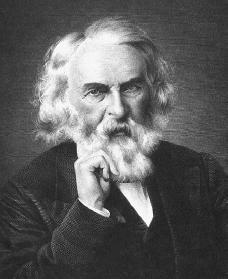 Henry Wadsworth Longfellow was born in Portland, Maine, on February 27, 1807, into an established New England family. As the son of a prominent lawyer, Henry was expected to have a similar profession as an adult. He attended Portland Academy and then Bowdoin College, in Maine, graduating in 1825. He was an excellent student whose skill in learning foreign languages led the trustees (persons appointed to administer the affairs of an institution) at Bowdoin (of which his father was one) to offer the young graduate a professorship of modern languages. He prepared himself further with study abroad (in Europe), at his own expense, before undertaking his duties. When he started his new position he had to create his own textbooks, because the study of modern languages was such a new field. During Longfellow's three years in Europe his lifelong harmony with Old World (European) civilization was firmly established. He returned home in 1829 and two years later married Mary Storer Potter. In 1833 he published Outre-Mer: A Pilgrimage beyond the Sea, a collection of picturesque (forming a pleasing picture) travel essays modeled after Washington Irving's (1783–1859) Sketch Book. In 1834 Longfellow accepted a professorship at Harvard University in Cambridge, Massachusetts. He did not start his new job until 1837, after he had completed a tour of European and Scandinavian (northern European) countries. During this trip his wife died. While staying at Heidelberg, Germany, he came under the spell of the works of the German romantic poet Novalis (1772–1801). Novalis's moody, mystical (pertaining to a spiritual event) nocturnalism (pertaining to the night) struck a responsive chord in the grieving Longfellow. Craigie House as a wedding present. This house became a famous visiting place for Longfellow's admirers. It is now called Longfellow House and is a national historic site. It holds most of the original furnishings from Longfellow's time, including his personal library of over ten thousand books. Longfellow's poem "Hymn to the Night," in Voices of the Night, conveys the poet's debt to Novalis and his romantic kinship with the "calm, majestic presence of the Night." However, "A Psalm of Life," one of the best-known poems from this first volume, reflects the influence of the famed German poet Johann Wolfgang von Goethe (1749–1832). His forceful philosophy suggested to Longfellow the direction of his hymn to action: "Life is real! Life is earnest! / Be not like dumb, driven cattle! / Be a hero in the strife." Voices of the Night was well received, and within a few years forty-three thousand copies had been sold. Longfellow's audience as a popular writer was assured. Longfellow's next volume, Ballads and Other Poems (1842), contained two strong narrative poems, "The Wreck of the Hesperus" and "The Skeleton in Armor," as well as the sentimental verses "Maidenhood" and "The Rainy Day" ("Into each life some rain must fall, / Some days must be dark and dreary") and the moralizing (explaining in the sense of right and wrong) poem "The Village Blacksmith." After a trip to Europe in 1842 Longfellow published Poems on Slavery (1842) and The Spanish Student: A Play in Three Acts (1843). In 1845 two volumes of poetry appeared: the anthology (a series of chosen literary pieces) The Waif, to which Longfellow contributed the poem "The Day Is Done"; and The Belfry of Bruges and Other Poems. Several poems in this second collection reflect Longfellow's deep attachment to the traditions of European culture. In addition, this volume contained the popular "The Old Clock on the Stairs," "The Arrow and the Song," "The Arsenal at Springfield," "The Bridge," and one of his best sonnets (traditional, fourteen-line poems), "Mezzo Cammin." Longfellow wrote several epic poems. An epic poem is a long poem that tells a story, typically about a hero, and centers on uncommon achievements and events. He achieved a national reputation with the publication of Evangeline (1847), a highly sentimental narrative poem on the expulsion (driving out) of the French from Acadia. He wrote Evangeline in dactylic hexameters. Dactyls are poetic feet of three syllables, with the first syllable long or accented and the others short or unaccented. Hexameters are verses having six poetic feet. The book was enthusiastically received. Longfellow next released the unimaginative romantic novel Kavanagh (1849) and By the Seaside and the Fireside (1850), which contained the very popular nationalistic (designed to arouse pride in one's country) poem "The Building of the Ship": "Thou, too, sail on, O Ship of State! / Sail on, O UNION, strong and great!" In 1854 Longfellow resigned his Harvard professorship to devote himself to his writing career. A year later he published The Song of Hiawatha, a narrative epic poem on the Native American. For this work Longfellow drew on Henry Schoolcraft's books on Native Americans. He wrote in trochees or poetic feet of two syllables, the first long or accented and the second short or unaccented. In short order, he repeated the success of Hiawatha with The Courtship of Miles Standish (1858). Following the tragic death of Longfellow's second wife in a fire in their home in 1861, he busied himself with the Tales of a Wayside Inn (1863), in which various speakers, sitting around a fireplace, narrate stories. Other tales appeared in 1872 and 1873. Longfellow also translated poetry from eighteen languages. His most significant translation, published in 1867, was of a long poem by the medieval writer Dante Alighieri (1265–1321) called the Divine Comedy. In the last phase of Longfellow's long career, he worked on another major project, The Christus: A Mystery. Completed in 1872, this work was concerned with "various aspects of Christendom in the Apostolic, Middle, and Modern Ages." The work came in three parts. An earlier work, The Golden Legend (1851), formed part II; part III, The New England Tragedies (1868), dealt with Puritan (a religious group in New England that stressed a strict moral code) themes; and, finally, part I, The Divine Tragedy (1871), concerned the life of Jesus Christ. Several more volumes of Longfellow's verse were issued before his death on March 24, 1882, in Cambridge, Massachusetts. After his death, he became the first American whose bust (sculpture of one's head) was placed in the Poet's Corner in Westminster Abbey, London, England. To the modern reader, Longfellow's sentimental and optimistic poetry often sounds old-fashioned. He used his wide knowledge of the literature of other countries as a source for both the form and content of many of his poems. Several of his poems are set in other countries including Italy, Spain, France, and Norway. It should be remembered that Longfellow wrote for the common man. In his elegant and clear style he presented popular American values, such as the family circle and heroism. Arvin, Newton. Longfellow: His Life and Work. Boston: Little, Brown, 1963. Carpenter, George Rice. Henry Wadsworth Longfellow. Boston: Small, Maynard, 1901. Reprint, Philadelphia: R. West, 1978. Lukes, Bonnie L. Henry Wadsworth Longfellow: America's Beloved Poet. Greensboro, NC: Morgan Raynolds, 1998. Thompson, Lawrance. Young Longfellow, 1807–1843. New York: Macmillan, 1938.